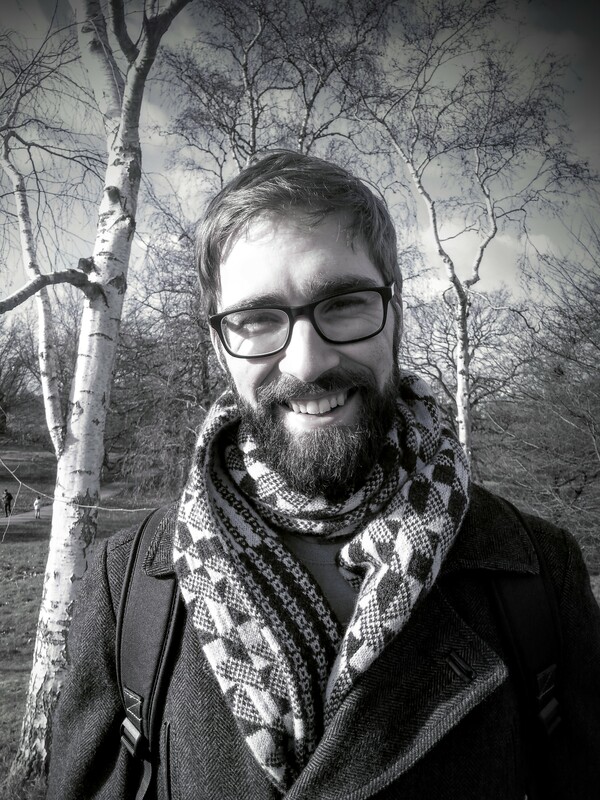 Ewan Davies is a PhD student in the Department of Mathematics. 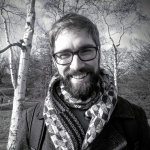 His research is on graph theory, the study of connected systems of abstract ‘things’ which we call graphs. In this example the ‘things’ in the graph are particles of a gas or atoms in a molecule, and he developed a new method for understanding mathematical models in these graphs. More information about Ewan’s research is available on his website. Mathematicians often study models of complex systems which arise in the real world, such as population growth, the internet, or a room full of gas particles. It is usually necessary to make vast simplifications in constructing mathematical models due to the sheer size and complexity which the physical systems can exhibit. In this post we discuss a couple of examples about microscopic particles in a gas or a molecule. The main motivation for studying the two types of model in this article is fairly simple: to better understand the basic properties of some important physical things, such as gases in a room or molecules in a polymer. A key feature of this kind of mathematics is that we study such abstract models that a variety of applications can be found. Examples relevant to our first model, the hard-core model, include liquids freezing into solids, moving gases with large particle sizes, magnets, and even the distribution of telephone calls around a network. Our second model, the monomer-dimer model, has links to polymers in chemistry, adsorption physics, quantum computing, and combinations of placing castles on a chessboard. The basic principles of both the hard-core and the monomer-dimer model are that we imagine particles are connected together in some sort of regular (often grid-like) pattern, and select at random, according to some rules, a collection of particles. Following something known as Boltzmann’s principles of statistical mechanics, we assume the random selection is according to a special rule called a Boltzmann distribution. In our examples, this amounts to taking a random allowed collection of particles, where each collection with size occurs with a probability proportional to , where is a parameter called the activity. Low activity means we are likely to select small configurations. Higher activities mean we are more likely to select large collections. The simplest case is when , which makes each configuration equally likely. In the hard-core model we randomly select some particles which are not connected to each other directly, and call these particles occupied. This means the possible configurations are collections of particles such that no two of them are adjacent. Pictured are two examples on a small 2-dimensional grid. The particles can occupy points where the grey lines intersect. An occupied point is coloured black. In Figure 1, there is low activity and the particles do not have an any discernible structure. In Figure 2, the selection was made with a higher activity and you should be able to notice some structure, which we mention later. For the monomer-dimer model we select adjacent particles to join together in pairs we call dimers. An example from chemistry would be molecules of acetic acid (part of vinegar) in a gas. They usually exist on their own (called monomers) but can also stick together in pairs (these are the dimers). In the mathematical model, we choose some of the grey lines between particles and imagine they form a bond between the particles they connect. We assume that each particle can be in at most one dimer, and so each particle has at most one bond attached to it. There is usually more than one possible bond that each particle can form. There are two examples below (figures 3 and 4), in which the possible bonds for each particle are the grey lines coming out from the particle. The bonds selected to form dimers are coloured red. Physicists and mathematicians have studied various properties of these models, such as seeking to count the number of allowed configurations (this is actually very difficult for big systems) and to find out whether adjusting the activity of either model can lead to interesting behaviour such as a phase transition. A phase transition is the emergence of some structure in the randomly selected particles as the activity increases. In the hard-core model on the grids pictured in figures 1 and 2, we can label each particle odd or even according to whether the distance along the grid lines from the particle to the bottom-left of the grid is odd or even. At low activities the occupied collection is unstructured: about half the occupied particles should be at even distance, and half at odd distance. With high activities we see much larger collections of occupied particles, and either most particles are even or most particles are odd. This ‘structure’ is very different from the roughly equal division at low activities. When we make the random choice of occupied particles or dimers in the models above, we can compute the average fraction of occupied particles or dimers subject to the random choice. This average is called the occupancy fraction, or for short. In our recent work, we studied all systems of particles in which each particle has grey lines coming out of it. These are called -regular systems. 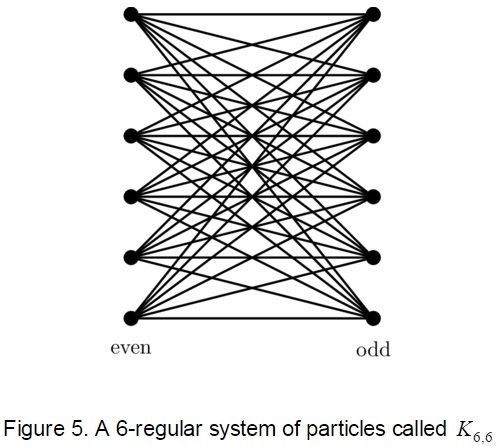 An important example of such a system is called in which there are two sets of particles called even and odd, and each even particle is adjacent to each odd particle. In a collaboration between Will Perkins from the University of Birmingham and Ewan Davies, Matthew Jenssen, and Barnaby Roberts from the LSE, we prove the best possible upper bounds on the occupancy fraction in both the hard-core model and the monomer-dimer model over all -regular systems. We show the unique maximum comes from considering systems formed of multiple copies of . For the hard-core model this improves on previous work by Kahn, Galvin and Tetali, and Zhao which (amongst other things) showed that that multiple copies of maximise the number of allowed collections of occupied particles. Our result about maximising occupancy fraction is technically stronger because it implies this result via some calculus. In the monomer-dimer model there was no previous result about maximising the number of allowed collections of matched particles. We also show for the hard-core model that homogenous systems of particles have an occupancy fraction larger than that of the infinite -regular tree. The analogous result for the monomer-dimer model was already proved by Csikvári. For physicists who study these models and related ones, our work represents a new way of counting the number of allowed configurations via occupancy fractions. Managing to count the configurations for any activity constitutes fully understanding the model for many problems in statistical physics. Our proofs use a new technique involving a constrained optimisation problem over distributions of random variables. A feature of the argument is that, in contrast to previous work, we work more probabilistically with the models instead of combinatorially, counting homomorphisms. For further details, a preprint of the paper can be read here. All work on this blog is licensed under a Creative Commons Attribution-NonCommercial-ShareAlike 4.0 International License.